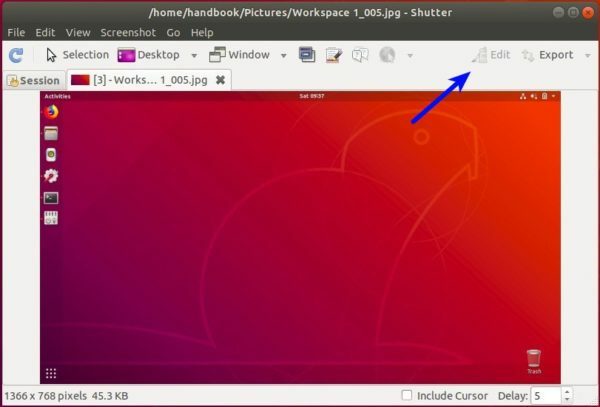 After installed my favorite screenshot tool Shutter in Ubuntu 18.04, I found that the Edit button is greyed out. And this quick tip is going to show you how to re-enable the editing feature in Shutter. To re-enable the “Edit” option, Shutter requires libgoo-canvas-perl library which is not available in Ubuntu 18.04 main archive. As a workaround, you can grab the package, as well as dependencies, from Ubuntu 17.10’s repository. To apply changes, kill Shutter process or restart your computer! You’ve saved me, man.. Thanks..
or maybe just “killall shutter” or for more flexibility try the “pkill” command. Nobody seems to bother about the tiny icons on the bar on the left, but it really is a problem. The Qt5 Configuration Tool does not seem to help either with the icon size here. Is there really no way to fix this problem, e.g. on Ubuntu-Mate? And restart Shutter to apply changes. Thank you! Its help me a lots. Shutter is a reason why i love ubuntu with screenshot and built in editor. Very cool! Made my day! THX! Thanks for detailing the steps so nicely. Nice write up! Thank you!! Thanks for the article! Really nice after the 18.04 upgrade!!! Terrific! 18.04 can now remain. I was close to rolling back because of this issue. Shutter is an essential tool in my work. Thanks a lot – this worked like a charm. Wondering why something important like that got forgotten. Thanks for taking the time to write that up so well. Clear and effective!!! Please tell more about the problem, since the edit option is working well in my case. Selecting previously unselected package libgoo-canvas-perl. Package libgoocanvas3 is not installed. Package libextutils-depends-perl is not installed. Package libextutils-pkgconfig-perl is not installed. After this operation, 455 kB disk space will be freed. It prompted that “Package libgoocanvas3 is not installed”. Please download and install the three packages in turns. First libgoocanvas-common, then libgoocanvas3, and finally install the libgoo-canvas-perl package. Can’t find the same packages for amd 32 bits, can you help me? applied it as per your detailed description and it is working fine. You make my work a lot easier ! note: since Ubuntu 18.04 installation , I had to use pixlr.com/edit for making edit to my screen shots. This useful information also works on Linux Mint 19 that suffers with the same problem. Works on Linux Mint 19 XFCE! Many thanks! Super helpful on 18.04! Thank you. You Rock!!! Thanks for solving this issue. They need to fix that and get these packages or rebuild this feature to not use them. thanks a lot man. accurate and precise. It worked just fine! Thanks! Thank you very much for this fix. Is it okay for me to refer your link in my blog ? Being a windows user, the “kill shutter” just meant to me to close the open window. I now found out that either I had to shutdown and restart my pc, or use the “kill shutter” command from the terminal window. I did try a restart, but that did not do it. The kill command did it for me. It’s those little things that drive us old windows users nuts.